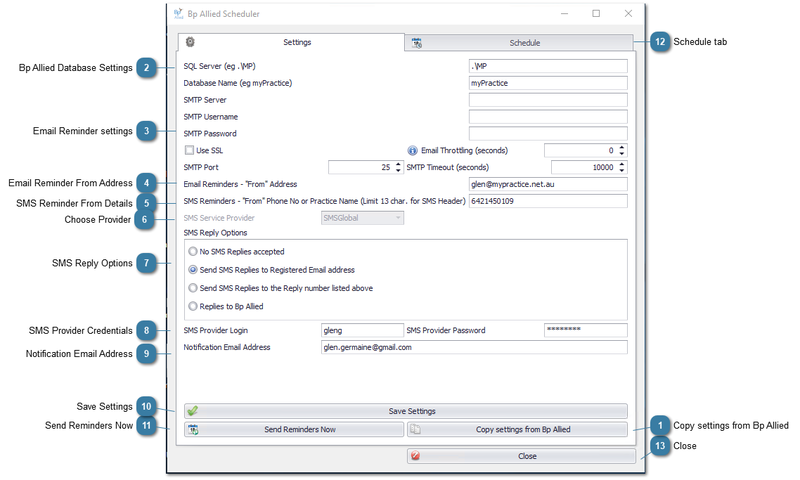 This tab in the scheduler is used to record the settings required to enable both email and SMS messages to be sent and received by Bp Allied and the Bp Allied Scheduler. The information is the same as that recorded within the Bp Allied Options > Reminders settings. These settings need to be set up in conjunction with the settings saved in the Schedule tab. If Email and SMS reminder information is already set up in Bp Allied, click this button to copy the settings over. Only the blank fields need to be filled, unless a setting is incorrect in which case it should be corrected. This information should be copied across regardless of any settings already setup as this information is required for Bp Allied to save information into the database. Please call Bp Allied if you need help with this as it is information that we can easily help with. Database Name - the name of the Database within the SQL Server instance. It is usually Bp Allied or a version of your practice name if your database is hosted. SMTP Server - This is the server used to send your email. It is usually prefixed by "mail" or "smtp". This information will be available on your email hosts website. Search for details on the "Outgoing" or SMTP mail server. SMTP Username and Password - This is the username and password used to access your email. Use SSL - This will be dictated by your email host. Email Throttling - As some ISP's throttle the number of email that can be sent per minute (or other period of time e.g. per 10 minutes) this allows emails to be delayed between sending to work around these restrictions. Note, this also may need to be used if Reply to Email is the SMS reply method as the SMS's actually get sent as an email behind the scenes. SMTP Port - The SMTP Port is the channel that the mail is transferred using and will be dictated by your email host. For example gmail is 465 and hotmail is 25. SMTP Timeout - The timeout indicates the time allocated to trying to send a message before it stops trying, if, for some reason the message cannot be sent. Most email hosts also have recommendations on this timeframe. Google suggests between 1 and 5 minutes. This is the address that the reminder email is addressed from. It does not have to be the reply to email address. It would be usual for this to be a central email address, for example, admin@yourmaildomain.com.au or reception@yourmaildomain.co.nz. This is the phone number or name that the SMS Reminder is addressed from. For Bp SMS, this is the location of the dedicated number, if being used. A dedicated number is only available for Australian customers. These options will be only made available once the database values have been saved and will be disabled for other database versions. These options only apply to SMS Global. All reply options for SMS Central are set in their web interface. There appears to be some phones / networks that do not receive the reply number correctly so not all clients maybe able to use this option and hence the reply number should be included in the reminder message. 3: Send replies to Bp Allied. These will appear in the Incoming Messages screen. The options available for Bp SMS are either No replies accepted or Replies to Bp Allied. No password is required for Bp SMS, however, the Site ID and Activation code must be entered via Options > Reminders > BP SMS in the Bp Allied application. This is the address that the reply email is to be sent to. It would be usual for this to be a central email address, for example, admin@yourmaildomain.com.au or reception@yourmaildomain.co.nz. Click the Schedule tab to setup when the reminders are going to be sent.